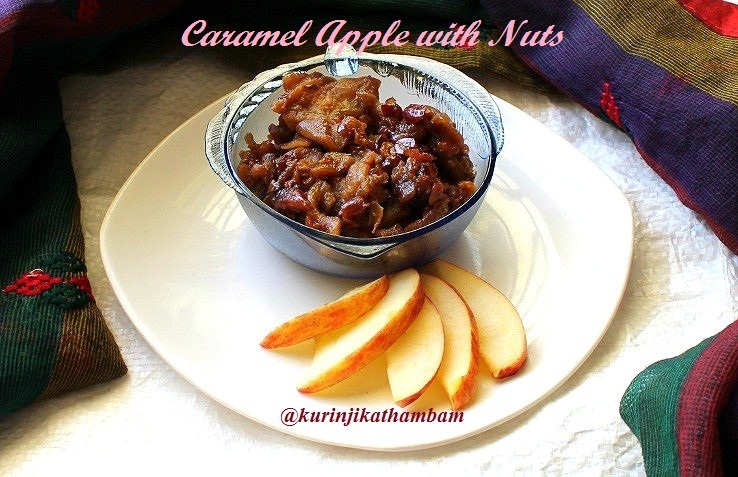 Caramel Apple is a type of dessert. This is recipe of my cousin sister. We tried it together and my family liked it very much. Caramelized apple slices is a completely different taste. 1. Wash and peel the skin of the apple. Then cut it into very thin and lengthwise slices. 2. Cut the badam into thin slices. 3. Coarsely grind the ground nuts using the mixie. Just give only one ??? 1. Heat 1 tbsp of butter in a heavy bottom pan. Add 2 tbsp of naattu sakkarai and wait for it to melt completely. 2. Then add the apple slices and mix them well. 3. 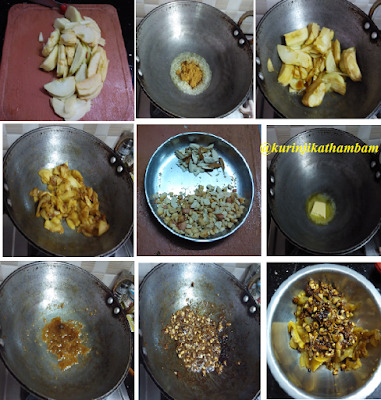 Stir occasionally and cook till the apple becomes tender. 4. Remove from the heat and transfer into a bowl. 5. In the same pan, add ½ tbsp of butter, add ½ tbsp of naattu sakkarai. Wait for it to melt completely. 6. Then add the chopped nuts, mix them well till they become thick. 7. Now mix this nuts mixture into the apple mixture. 8. Allow it to cool down and serve. Otherwise keep it in the refrigerator for an hour and serve. Serve it with ice cream also. 1. Type of nuts is your choice. SIMPLE VERY NICE DESCRIPTION !! WOW :) I don't prefer cooking fruits usually. But your recipe is inviting.